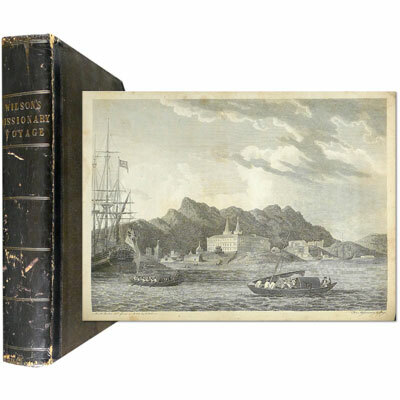 A Missionary Voyage to the Southern Pacific Ocean, Performed in the Years 1796, 1797, 1798, in the ship Duff, commanded by Captain James Wilson. Compiled from journals of the officers and the missionaries. With a preliminary discourse on the geography and history of the South Sea Islands; and an appendix, including details never before published, of the natural and civil state of Otaheite - William Wilson, James Morrison, Samuel Greatheed 1799 - Printed for T. Chapman by T. Gillet, London - First Edition [The Gillet Edition]	With six engraved plates and seven folding engraved maps. ‘The London Missionary Society was founded in 1795, mainly to send missions to Polynesia. The voyage of the Duff was undertaken for the purpose of establishing a mission in Tahiti, and a settlement of twenty-five persons was formed. Apart from the missionary interest of this account, the voyagers made many important discoveries of islands, including Timoe, Mangareva, and Pakarua in the Tuamoto Archipelago; Ongea and Fulanga Islands; Vanua Mbalavu, and Satawal, Lamotrek, Elato, Ifalik, and Woleai atolls in the Western Carolines, before putting in at Macao. A new group of islands, named the Duff Group, was discovered among the Santa Cruz Islands. On the outward voyage, the expedition visited Rio de Janeiro. According to Hill, there were almost certainly two printers ‘employed by Chapman in order to speed up the job of publishing, the text in both printings is the same’. References: Hill, Pacific Voyages, 1894-5. Cox, Literature of Travel, V2 307.